Investment and all other economic actions depend on subjective expectations. The problem is how to construct a theory of expectations that assumes people interpret their situations in unpredictable ways. 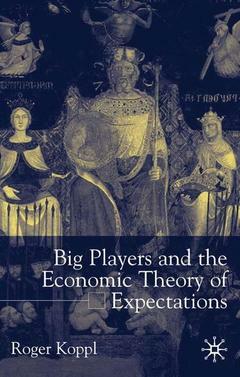 Building on the evolutionary economics of F.A.Hayek, Koppl gives us such a theory. This includes a theory of Big Players , demonstrating that discretionary policy interventions create ignorance and uncertainty. The volume uses innovative methods to address many vital problems in economic theory, and connects with many other schools of economics including New Institutional Economics, Constitutional Economics and Post Walsarian Economics.